How we stand has a massive impact on our musculoskeletal system. Pain from poor postures is a common theme amongst my patients. 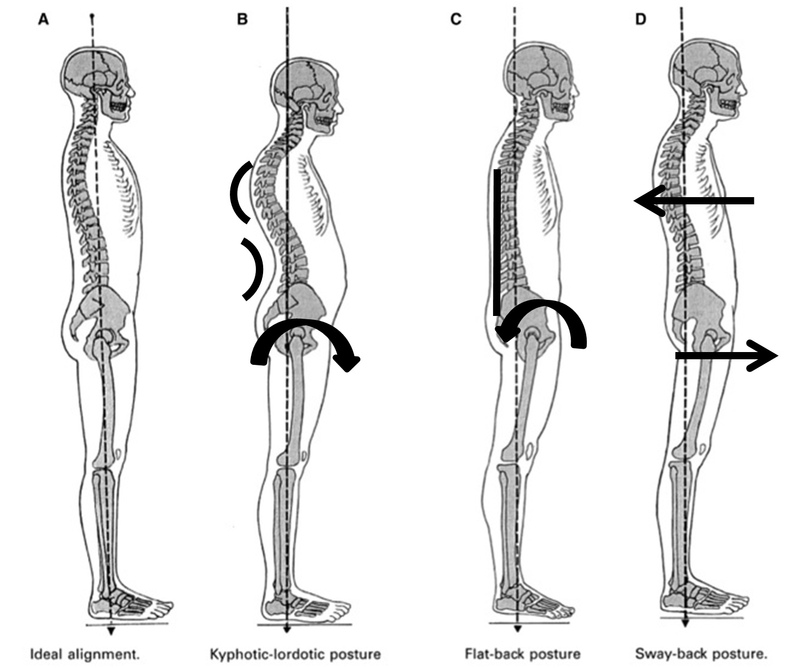 The image below demonstrates how different posture types impact the skeletal system. Ideal alignment (as shown in the fist image) is how we should stand. This posture places the least amount of pressure on our joints and soft tissue making us less likely to develop musculoskeletal pain. A kyphotic-lordotic posture type can not only put strain on the musculoskeletal system but also the respiratory system and digestive system. You can see how in this posture the head is forward and the neck is extended. This will likely cause some neck and shoulder pain as the neck joint are under stress and the shoulder muscles are tight. Your head weighs around a stone so carrying this posture will be hard work for your neck and shoulder muscles! It is also not unusual for this posture type to complain of headaches. The pelvis is tilted forwards which alters the ability for the abdominal and pelvic muscles to function properly. This also causes compression in the lower back joints which can also lead to pain. You can see from the picture that this posture doesn't allow much of room for good chest/rib expansion therefore reducing lung capacity. You can also see how the abdomen protrudes forward or sticks out. This compressive posture type can have a negative impact on digesting food and leave you with digestive discomfort. A flat back posture again tend to have a forward head position. Their spine tends to be very flat with the pelvis tilted backwards. They also tend to have hyperextended knees. It is this posture type that are more at risk of developing a disc prolapse due to the load alteration of the intervertebral discs. You tend to find this posture type have a very flat bottom! Their glutes (buttock muscles) have usually gone to sleep! A sway back posture is one that I commonly see in my clinic. You will see this person standing with their hips swayed forward. The hips tend to be in front of the ankles and they will struggle to see their feet! As their hips sway forward their upper back drops back which causes the head to go forward.These people are usually tight in their hamstrings and weak in the abdominals and glutes and psoas muscles (hip). These imbalances can lead to pain around the spine, pelvis and hips, as well as neck and shoulder pain. The picture highlights the lack of space for rib expansion which will again reduce lung capacity. Put simply poor posture puts starin on joints, ligaments and muscles which will eventually lead to pain. So how do we improve our posture type? Strengthen the postural muscles! Improving your posture through clinical Pilates exercise will correct your spinal alignment. At the beginning and end of all of our workouts Lyndsay will teach you how to stand correctly. Throughout the workouts you will work at strengthening the postural muscles and loosening the tight/stiff areas. See our posture improver workouts.